The Liberty Heights Tap Room in Red Hook was recently purchased by Black 47 frontman Chris Byrne. Chris Curen, who sent us this photo, captured it in mid-morph during the week into Rocky Sullivan's. Mr. Byrne also owns Rocky Sullivan's on Lexington Avenue. So, now, there are two. No, there will be one. 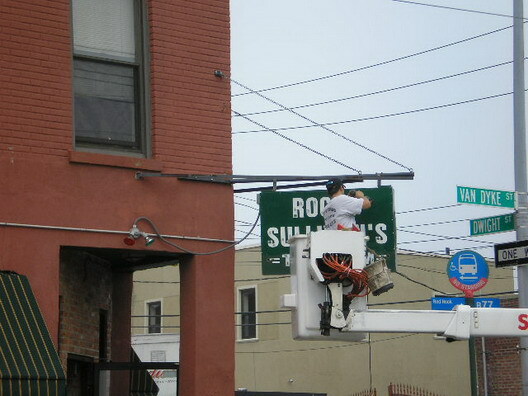 Rocky Sullivan's on Lex is to close at the end of the month (rent was tripled). I learned this from WBAI on Saturday but they never let on there was to be another apparition.